Following the EPA’s 2010 Air Quality ruling for reducing particulate matter and nitrogen oxides (NOx), most engine manufacturers have turned to Selective Catalytic Reduction (SCR) technology to break down emissions produced by diesel engines. The chemical reactions within the SCR system require a constant feed of ammonia gas, which is produced via a urea solution called Diesel Exhaust Fluid (DEF). An advanced injection system sprays DEF into the exhaust stream to convert the DEF into ammonia, which breaks down the NOx emissions into nitrogen and water. DEF is a non-toxic, colorless liquid comprised of 32.5% urea and 67.5% de-ionized water. It is not a fuel additive and never comes into contact with the diesel. It is stored in a separate tank and typically has a blue filler cap. No, run the tank as empty as possible before refilling. DEF fluid from different API-certified suppliers can be mixed. 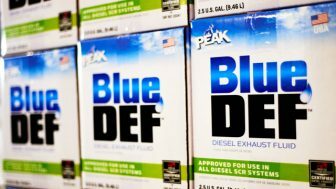 What happens to my truck/SUV if I run out of Diesel Exhaust Fluid (DEF)? The EPA requires all truck/SUV manufacturers to incorporate some kind of staged warning system much like you would have for diesel or gas to let the driver know they are low, on DEF, before they run out. When low, the vehicle will go into a low power mode and when it gets too low, it will not start. Of all the fluids in your car, DEF is the least hazardous. However, DEF is corrosive for some metals. Do not store DEF in metal containers made of the following materials: aluminum, carbon steel, copper, and zinc. No special clothing is needed when filling up your vehicle with DEF. However, it can stain clothes and should be rinsed off with water if spilled on. What should I do if there is a DEF spill? If you spill a small amount of DEF it can be washed away with water or wiped up. If left to dry it will turn into white crystals – these too can be washed away with water. DEF has a shelf life of two years. However this can be reduced if stored in direct sunlight or remains above 86 degrees for long periods. Valley Oil Company carries DEF fluid in 2.5 gallon jugs, 5 gallon cases, 55 gallon drums, and even 275 gallon totes. Contact us today to set up a delivery.